2013 education design showcase good designs don't just happen. 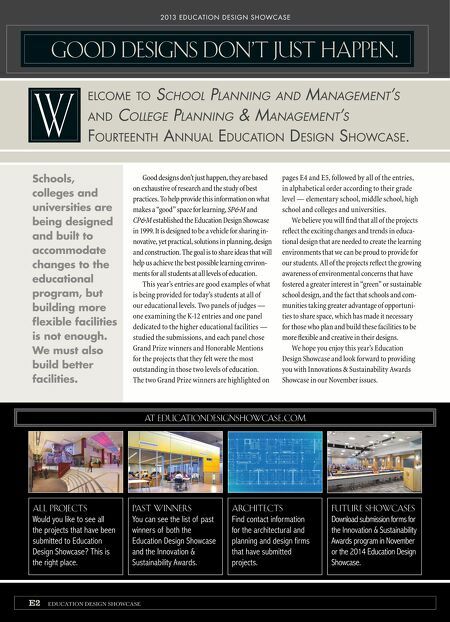 W School Planning and ManageMent'S and college Planning & ManageMent'S Fourteenth annual education design showcase. elcome to Schools, colleges and universities are being designed and built to accommodate changes to the educational program, but building more fexible facilities is not enough. We must also build better facilities. Good designs don't just happen, they are based on exhaustive of research and the study of best practices. To help provide this information on what makes a "good" space for learning, SP&M and CP&M established the Education Design Showcase in 1999. It is designed to be a vehicle for sharing innovative, yet practical, solutions in planning, design and construction. The goal is to share ideas that will help us achieve the best possible learning environments for all students at all levels of education. This year's entries are good examples of what is being provided for today's students at all of our educational levels. Two panels of judges — one examining the K-12 entries and one panel dedicated to the higher educational facilities — studied the submissions, and each panel chose Grand Prize winners and Honorable Mentions for the projects that they felt were the most outstanding in those two levels of education. The two Grand Prize winners are highlighted on pages E4 and E5, followed by all of the entries, in alphabetical order according to their grade level — elementary school, middle school, high school and colleges and universities. We believe you will fnd that all of the projects refect the exciting changes and trends in educational design that are needed to create the learning environments that we can be proud to provide for our students. All of the projects refect the growing awareness of environmental concerns that have fostered a greater interest in "green" or sustainable school design, and the fact that schools and communities taking greater advantage of opportunities to share space, which has made it necessary for those who plan and build these facilities to be more fexible and creative in their designs. 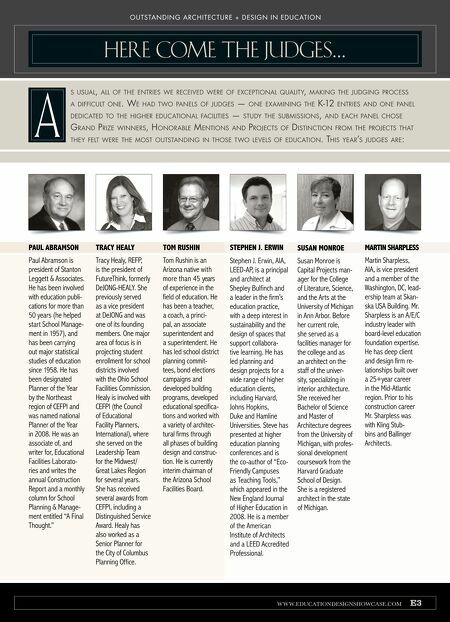 We hope you enjoy this year's Education Design Showcase and look forward to providing you with Innovations & Sustainability Awards Showcase in our November issues. AT EDUCATIONDESIGNSHOWCASE.COM all projects Would you like to see all the projects that have been submitted to Education Design Showcase? This is the right place. E2 past winners You can see the list of past winners of both the Education Design Showcase and the Innovation & Sustainability Awards. EDUCATION DESIGN SHOWCASE architects Find contact information for the architectural and planning and design firms that have submitted projects. future showcases Download submission forms for the Innovation & Sustainability Awards program in November or the 2014 Education Design Showcase.